Among the more interesting of MAD magazine’s recurrent gags are “fold-ins”. The back cover of almost every issue since 1964 had an image, with points at the edge of the page marked A and B. By folding the page so that those two points met, you’d reveal another hidden image, along with the punchline to a joke or the answer to a riddle. Among the indie games on show at this year’s Smash! Sydney Manga and Anime Show was Qinoto, a game inspired by those fold-ins, though it trades the irreverent comedy of MAD for a fairy tale world of fantasy and adventure. 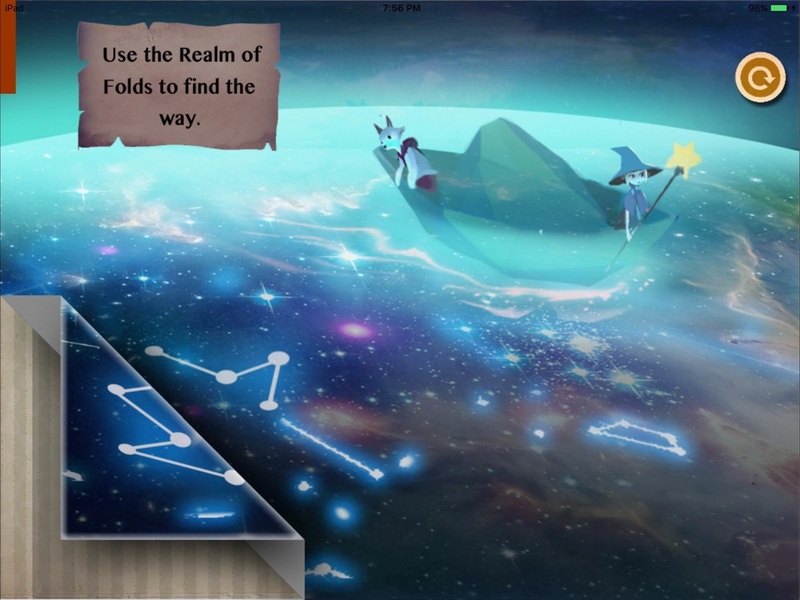 Playing as a young fox called Qinoto who’s on a quest to uncover her identity, you navigate the world and story by solving increasingly challenging fold-in style puzzles. Here’s an example from one of the first puzzles in the game: Qinoto has arrived at the outskirts of a village full of witches, but there’s no immediately apparent way to get past the wall that surrounds said town. A witch passing by advises the fox that if she wants to get in, she needs to find a hidden door shaped like a witches hat. Conveniently, among the windows and openings in the wall itself are two that look like the top and bottom halves of a point, wide-brimmed hat, though they’re separated by a big chunk of wall. By creasing the edge of either of those shapes and folding the page so that the two meet up, you complete the image, opening the door into the town itself. The Smash! preview build had some dozen or so puzzles, so I got to see a variety of the different tricks the game employs. Sometimes the answer will be hidden in negative space, like the gaps between a bunch of arrows pointing left combining to create another arrow that points to the right. Early puzzles tend to rely on vertical or horizontal folds, which are easier to visualise than the angled folds asked for later on. One particularly memorable puzzle asked you to literally turn the device upside down, or at least imagine the game screen from that flipped perspective. One thing I would have loved to see more of is puzzles that make use of the ability to rotate parts of the image. On real pieces of paper, these sorts of puzzles inevitably need two folds at least (though Qinoto simplifies that by asking you to draw only one, then assuming the position of the second based on how you love the image).By making those two folds at different angles, you could line up parts of an image that aren’t necessarily parallel. Qinoto approximates this by letting you rotate part of the image after making your first crease, but none of the puzzles I saw in the preview build really made use of this. I hope that the full version incorporates this a bit more, because it’d open a lot of new doors for puzzle design. The snippets of story I saw in the preview were rather charming, too. It seems like a classic tale of adventure and excitement, an through an adorable hero and an array of oddball characters she meets. There’s some delightful dialogue, from characters who speak in rhyme to a humorous exchange about the Witch Village—”Which village?”—that calls to mind Abbott and Costello’s old “Who’s On First?” routine. The scenes I saw seemed to be isolated moments from different parts of the game, so I couldn’t really get a good idea of the overall thing beyond the basic premise, but I’m intrigued to find out more. Qinoto is planned for release sometime next year for PC and mobile. Between its clever puzzles and enchanting fairy tale story, I can’t wait to see how the final game turns out.